The first week of 2018 pulled me in many different directions, in the best of ways. For Christmas, we received the book “Hamilton: The Revolution” by Lin-Manuel Miranda and Jeremy McCarter. I thoroughly enjoyed reading about the making of “Hamilton: An American Musical.” I learned a bit about what goes into making a musical, and the timeline in particular was eye-opening. I was amazed by the references that were worked into the lyrics from previous musicals and from the world of rap, and intrigued by the subtleties in the choreography. The energy with which Miranda approached the musical is inspiring and contagious, even through the pages of a book. When our children became old enough to attempt to stay awake until midnight on New Year’s Eve, we quickly learned that board games weren’t a good way to amuse them. As the hour grew later, the tears came more readily. 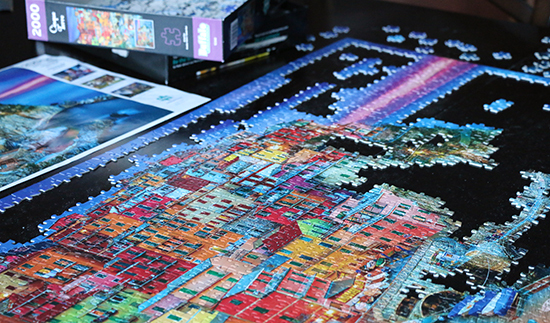 I started a tradition of opening a jigsaw puzzle early in the evening; it’s a bit more difficult (although not impossible) to burst into tears over the beginnings of a jigsaw puzzle. I mentioned in last week’s post that I want to finish setting up my sewing area this year, and I’ve started working on that in earnest. I can now access my sewing machine on its table! My new sewing area shares a space with our guest area and storage, so there is still a lot of random clutter in the room. I’m motivated to put all of those extra items away before I start sewing again. Unsurprisingly, I’ve also managed to spend some time with fiber in hand. In recent months, I allowed a lot of unwoven ends to build up on the two scrap blankets that I’ve been knitting. I caught up on all of them while watching end-of-season football. (Go Bills! Roll Tide!) I even added a few blocks to the smaller blanket with some new yarn samples. We celebrated a birthday, put away Christmas decorations, and enjoyed extra family time. Step by step, I’m finding my direction for 2018. Hi from The Front Porch. I'm loving your scrap blankets. Thanks, Barbara! Not only do they use up scraps, but they're relaxing projects that don't need too much thought put into them as I work.